Bring your recyclable items to our temporary recycling drop-off station on Saturday, October 20 between 8 a.m. and 2 p.m at the City Hall parking lot #11. What will be accepted? The City will also be collecting usable clothing and textiles for reprocessing into rags, insulation, and stuffing and the remaining natural materials left for composting. Computers • Monitors • IT Accessories • Printers • Network Devices • Scanners • Copiers • Fax Machines • Video & Audio Equipment • Phone Systems • TVs • Wires & Cables • And More! For more information, please contact Michael Lary, Director of Special Events at (248) 546-2361. 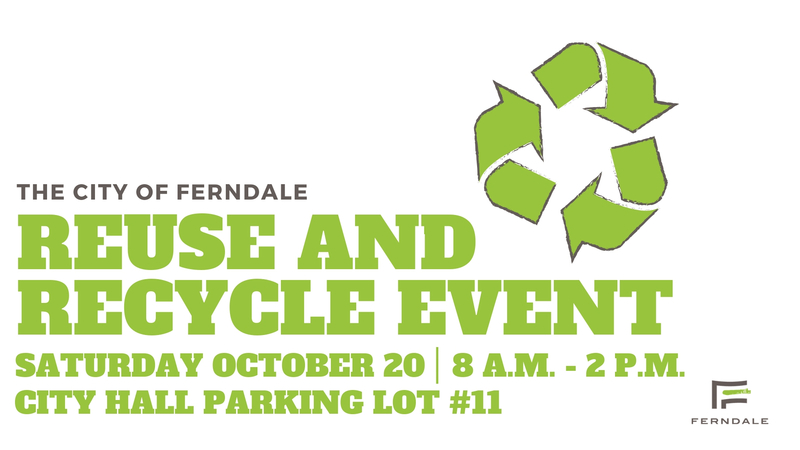 The Temporary Recycling Drop-off Station is limited to residents and businesses located within the City of Ferndale only. Proof of residence may be requested. The Temporary Drop-Off Station is operated by the Ferndale Department of Public Works. Based on the condition of all items, the City has the right to refuse any item deemed unsafe.